Good news everyone, you no longer need to use questionable methods (such as installous) to download 17+ apps in Saudi Arabia because some of the 17+ apps has started to appear in the Saudi App Store. 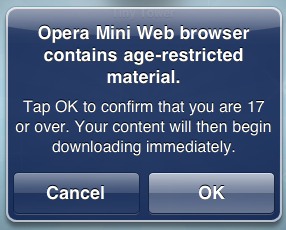 At least Opera mini is available right now. Other apps such as Atomic Web, iCab Mobile and Opera for Mac are still missing. A few months ago Apple removed all apps rated 17+ from the Saudi Arabia and United Arab Emirates App Stores. Just change your stores to Qatar and you’ll be able to download everything. dude if i change my app store to other country wht will happen to my existing apps will they be deleted ? No. Old apps will remain as it is.